Scoliosis is a complex condition that affects everyone differently. Accordingly, it is crucial to accurately diagnose and analyze each patient on a case-by-case basis, and design a treatment plan based on the individual’s unique situation. To achieve this goal, we employ the Clear Methodology System, a cutting edge protocol for correcting scoliosis. Prior to beginning the program, the Doctor must gather information about the biomechanical function of the spine – not just the area(s) affected by scoliosis. It is an axiom that you can control the middle of a cord by moving the top and the bottom. Therefore, it is imperative to understand what occurs in the neck and the hips in order to affect the middle of the spine. To obtain this information, seven precise x-rays are taken. A scoliosis x-ray is also mandated if a recent film is not available. These seven views include three side views of the neck, a side view of the lower back, two frontal views of the neck and one frontal view of the lower back. The patient warms up their spine by using several different techniques including the Active Rehabilitation Chair, Cervical Traction, and Vibrating Traction. In addition, a special motorized table with belts that gently pull the scoliotic curves out of the spine, called the Eckard Flexion/Distraction table, achieves the goal of re-structuring & re-modeling the ligaments after they have been relaxed. Mix protocols aid the intervertebral discs in remaining flexible in order to successfully effect structural changes to the spine. The patient is now primed to receive their chiropractic adjustment. Mechanical adjusting instruments and specialized drop pieces enhance the precision & effectiveness of chiropractic care, and reduce the amount of force required to correct the scoliotic spine. In accordance with CLEAR™ protocols, almost all adjusting of the neck will be performed with the use of such instruments, and the application of these adjustments will be correlated with the information obtained from the patient’s x-rays. SET protocols ensure that corrections achieved in the spine will not be temporary in nature. After the first 12 visits, a series of post x-rays are taken to validate the effectiveness of the treatment protocol to date. These x-rays are limited as much as possible to the patient’s specific condition. It is important to keep in mind that not every patient will show a reduction in the severity of the scoliotic curve, as measured by Cobb angle, within this initial time frame. This is due to the fact that the Cobb angle is a measurement of only one dimension of the spine, and scoliosis is, in fact, a three-dimensional condition. Before the sideways curve can be reduced or corrected, the spine must be de-rotated and de-compressed in the other two dimensions. Treating a complex spinal disorder such as scoliosis is similar to reversing the path of a runaway train- It takes time to first slow down the momentum, then more time, to change the course of the disease. The importance of active home participation in the CLEAR™ program is a key component in achieving long term results. Research clearly supports this theory, as the level of effectiveness of the program has been increased 2-3 times. As stated by Hippocrates, the Father of Medicine, “The patient must combat the disease along with the physician.” Results are not guaranteed – they are earned, by patients who are willing to work alongside of the doctor. The traditional methods of scoliosis treatment, bracing & surgery, are considered “passive” therapies, in that the patient has the procedures done to them; the doctor designs the brace, the doctor performs the surgery. CLEAR™ Institute’s method, by comparison, should be considered an “active” process – that is to say, the doctor teaches the patient how to do the procedures, and the patient does them. A small portion of our protocols could be considered passive modalities, but the effectiveness of these treatments on their own is limited without the involvement of the patient. The patient’s degree of participation determines their degree of improvement. As a CLEAR™ Institute certified location; South Florida Scoliosis Center (SFSC) does not endorse any type of bracing. In fact, the cumulative clinical experience of the doctors on the CLEAR Board of Advisors demonstrates that attempting to utilize a brace while the patient is undergoing CLEAR™ treatment may have an adverse effect. CLEAR™ protocols attempt to strengthen the same postural muscles which are made weaker by relying upon the brace. On the other hand, CLEAR™ readily concedes and we at SFSC agree that our specialty is not in orthotics, but in spinal biomechanics & postural rehabilitation. It is for this reason that, while we do not advocate bracing, we also do not condemn it. What matters most is that the patient is satisfied with the outcome of treatment. 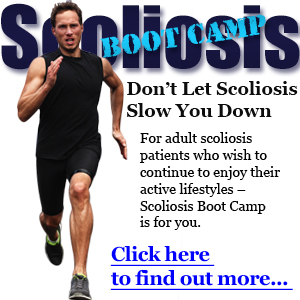 Patients who have undergone scoliosis surgery in the past may wish to pursue CLEAR™ treatment. However, these patients should not expect any degree of correction, but rather purely symptomatic relief & functional improvement. CLEAR™ Institute does not recommend that a patient undergo rod removal surgery. While no CLEAR™ doctor has worked personally with a patient who has had surgery to remove the spinal instrumentation, our understanding of biomechanics leads us to conclude that the same muscular atrophy which occurs in the brace, due to lack of motion, will undoubtedly occur in surgically-treated patients as well. If the muscles responsible for moving the spine are inactive for long periods of time, they will atrophy, and because rehabilitation of the muscles is a vital part of our protocols, the patient may be unable to maintain any corrections that are achieved.